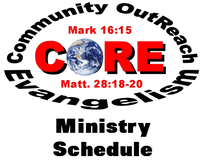 Download this file to get a copy of our Spring and Summer Outreach Schedule for 2019! This is a must hear for any Christian! Ray is inspiring, witty, and powerful. This message may very well shake you to your core! Please listen and share! This second message from Ray will help you to recognize the difference between a Christian and False Convert. This is so important if we care for people's souls! Do you know anyone who professes Christ but seems to bear no fruit for His glory? Have you examined yourself? Please listen and share! The Books, Articles, and Audio/Video Media in this Section are dealing specifically with Evangelism and Salvation. All are FREE to Download! Classics from Legends of the Faith! "The Soul Winner" by C.H. Spurgeon is truly a jewel for those who desire to "Do the work of an evangelist." Truly a must read! "The Great Separation" by J. C. Ryle is an excellent short booklet that speaks to those both completely outside of the Church and those of us inside. However, the primary audience is those who profess to know Christ but are truly tares among the wheat. He gives strong admonition coupled with passionate pleading for souls. An excellent read! This is a short read(Literally just a few pages)but very informative and important. Much like Baptismal Regeneration is a false teaching so is the more subtle Decisional Regeneration taught widely today in the church. Friends, I cannot recommend this book highly enough. However, it will most likely agitate you. Maybe even anger you. I pray God uses it to motivate you to repentance and obedience if necessary. "Apocity" is a new word, coined by the author himself. So, don't worry about never hearing about it before. After reading this book you'll probably never forget it. I happily paid for this book, you can now get it free! Don't miss out! This book shows why modern evangelistic messages are missing so much. This is an easy read for anyone at only 128 pages. You will be inspired and encouraged! Go to the following website for more info and to download FREE! This is a short 16 page witnessing manual designed by Todd Friel in conjunction with Living Waters. This will help you to properly share the Gospel with those you meet. The last couple pages are filled with effective scriptures for evangelism. This is a very short, illustrated 6 page bookelt. You can print off and keep it with you in your Bible or pocket as you go out and share the Gospel. Great step by step layout as well as great quotes from great preachers of the past. Here's another great Quick Refernce resource from Living Waters. They Reccomend you paste it in your Bible. It goes through the WDJD process as well as deals with certain religions and alternate views. This is a booklet I put together listing our legal rights to gather and preach the word of God in this Country. There are cases for the U.S. in general and even some Oregon Specific cases that support our rights. Also included is contact info for Christian Legal Counsel. God bless as you boldly proclaim the Gospel! Below is a detailed and sincere call to the church of Jesus Christ to pray and to fast for God's glory and revival for our nation. This is not so much a model of how you are to pray and fast as much as it is a detailed biblical explanation as to why we need to do this. Please download and read this important paper. The following 2 files are in the Libre Office Writer format. This is a free program that includes a whole Office suite. I tried converting to .pdf but it looked horrible so I left in this format. I make the two sheets into one. It includes a gospel tract on page 2. God bless!